Those who have authoritative roles within a company must always be able to keep track of the employees. This is especially true when it comes to their attendance and performance as they want to make sure that these people actually have some sort of value that will benefit the business. 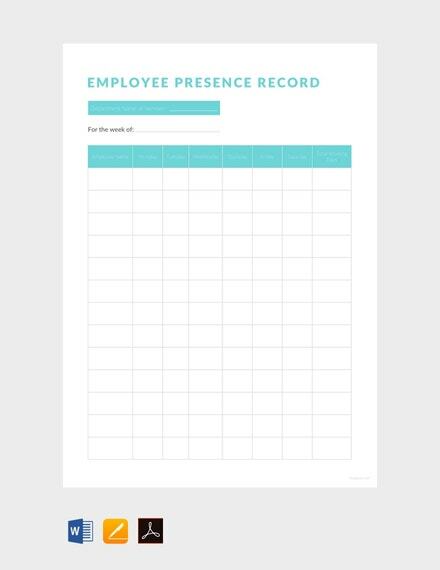 One of the best ways to keep track of these employees is by using employee record sheets. And that’s why this article is going to give you all of the information that you are going to need in order for you to understand how you should go about in making one. 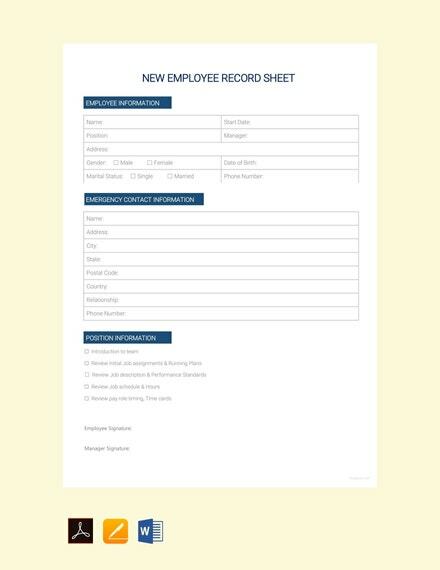 When you begin making a new employee record sheet, you should know that there are a couple of basic elements that must always be included. Without them, then the record sheet will not be able to present the information that you are going to want to learn about a specific employee. Title: This is something that you’ll want to have at the very top of the sheet. The reason as to why this is important is because it’s what will tell you exactly what the sheet is for. So as you’re coming up with the title, you have to make sure that it’s directly related to the purpose of the record sheet. 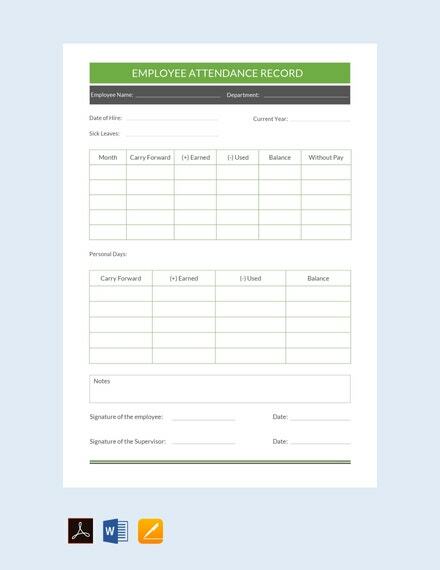 Names: Since you’ll be using the sheet to keep track of an employee, then you’ll obviously want his/her name. Make sure that you have the complete name written down into the document so that there won’t be any questions in regards to the employee’s identity. Employee details: Aside from the employee’s name, you’ll also need to have him/her include other employment details as well. Two good examples would be the employee’s job title as well as the department in which he/she is assigned to. Date: You’ll want to know the exact date that the record sheet was made for as this will come in very handy for when you have to pull out the details regarding the matter. Be sure to write down the complete date so that there won’t be any confusion. Now that you’ve managed to learn what it is that you should place in a record sheet, then the next thing that you’re going to have to do is to learn the things you have to do in order to properly make one. It’s not enough to know the basic elements as they are still things that you’ll need to consider in order to make one that looks organized and professional. 1. Gather the Details for Who the Record Sheet Is For: Remember that the first thing that you’re going to have to do before you even start making one is to know exactly who the record sheet is meant for. If you want to be able to keep track of a specific employee in terms of how he/she is doing in the company, then you’ll want to have his/her name and other details in the record sheet. So first, start with that employee’s name. Make sure that you include his/her first name, last name, and middle initial to ensure that you know exactly who the record sheet is for. Once that’s done, proceed in writing down the employee’s other details. Remember that you’ll want to include information such as the employee number, job title, and possibly even the date that he/she was hired. The kind of information you’ll be required to place will depend on the type of employee record sheet that you’re going to have to make. So long as you know what that is, then you shouldn’t worry too much in regards to what you should put into the sheet. 2. Write Down All of the Other Information That’s Meant to Help You Keep Track of the Employee: Once you’re done providing the employee’s details, the next thing you’re going to be doing is to write down all of the information that’s required to help you understand how the employee is doing in the company. Again, this will depend entirely on the type of employee record sheet, meaning that the information you’ll be placing won’t always be the same. 3. Names of Those Who Created and Approved the Sheet: It’s not just the employee whose information should be shard, but also that of the person who is in charge of making the sheet and the person who approved it. All you have to do here is to write their complete names as well as their signatures. The reason as to why you need both is so that those who wish to verify their identities will easily be able to do so. Follow a proper format: When it comes to making just about any kind of record sheet, there’s a format that you’re going to have to follow. 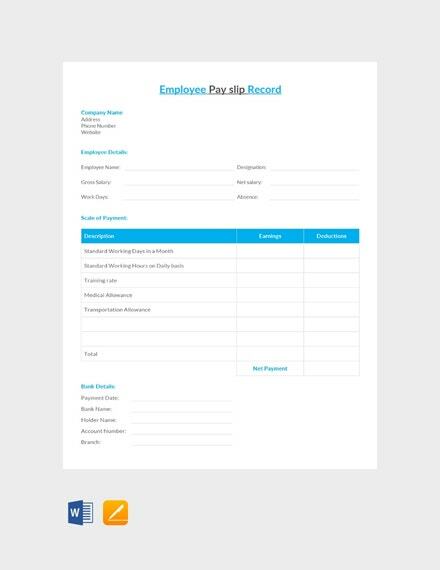 Take note that all of them have different formats, meaning that you’ll want to know the ones specifically for employee record sheets. Always check for mistakes that need to be corrected: The last thing that you want to do is to make a mistake in crucial pieces of information. 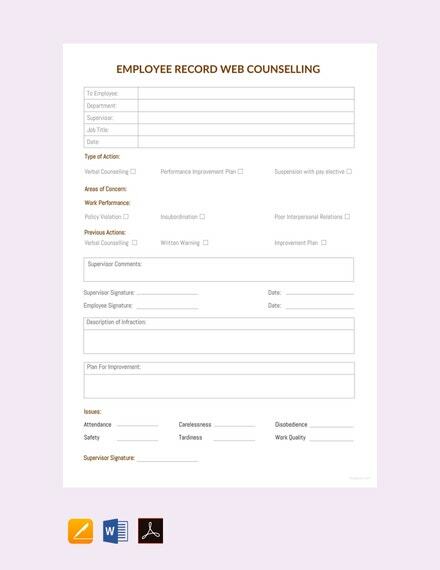 So what you’ll need to do is to go through the employee record sheet at least twice so that you can spot and immediately fix any mistakes that you may have made. In the even that you would like to learn about the other types of record sheets that you could possibly make, then all you have to do is to go through our site until you are able to get the information you need. 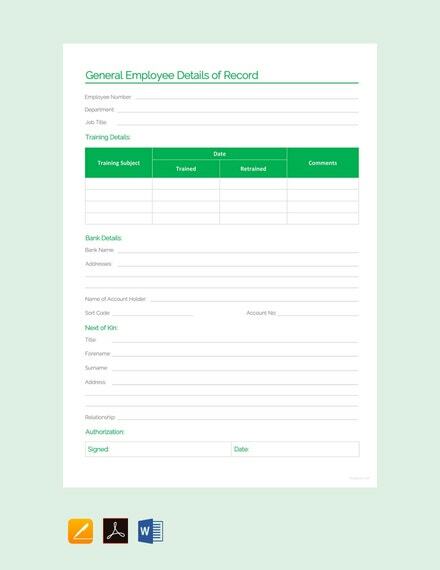 When it comes to making an employee record sheet, you should know that the standard size would be measured at 8.5 by 11 inches. This would be about the same size as your typical A4 or US. Know that it’s best to stick with the standard as it looks more professional and the majority of the people are accustomed to it. While you could go with a size that’s slightly larger or smaller, it’s recommended that you don’t deviate from the standard size. What Can I Use to Make an Employee Record Sheet? There are so many types of Word programs that you can use to help you make one. The most popular among them is Microsoft Word as it has all the tools that you’re going to need and it’s relatively easy to use. However, it’s ultimately up to you on what you want to utilize as it’s a matter of personal preference. Yes. 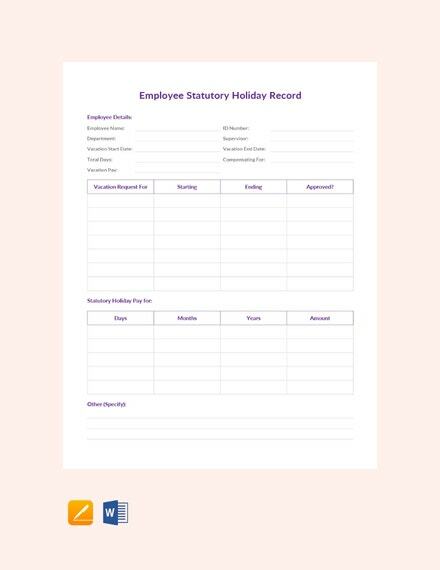 You simply need to download an employee record sheet template, make use of the program that you’ve installed to open it and make whatever changes you think are necessary. There are also templates that are available in this article should any of them be of any use to you. 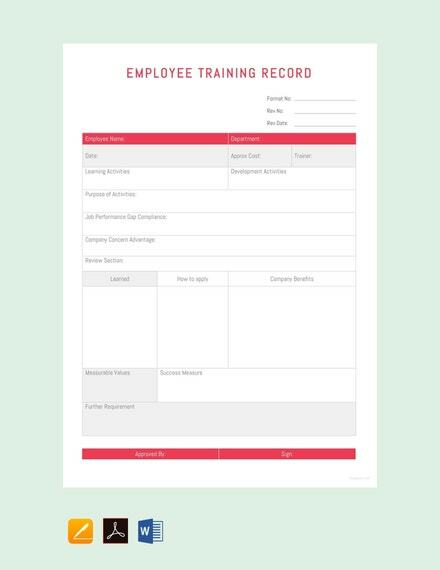 Coming up with an employee record sheet isn’t exactly the hardest thing to do, but you still have to make sure that you’re able to make it well. So make the most out of the information presented in this article to give you all the help that you need.